I spent a little time out at the Aviation Station at KPTK (the home base for Acro Camp) last night with parachute rigger Todd Ames. 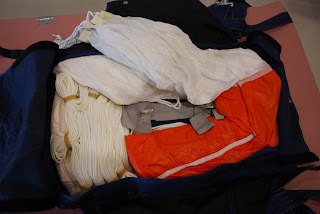 Two of the chutes that we’re going to use were coming due for their re-packing and I wanted to get an idea of what the guts of a parachute look like and how the repacking process works. 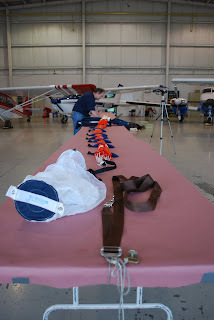 We set up tables in the hangar and then Todd performed the repacking. I filmed the process for the movie and shot stills as well. One of the cooler parts was actually deploying the chutes. Todd pulled one for the camera and then laid it out, inspected it, and re-packed it. Then it was my turn to pull. You stick your thumbs into the D-ring and pull straight out from your body. 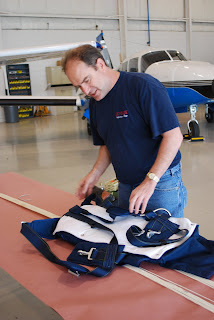 The pilot chute is spring-loaded and it fires the pilot chute about eight feet away from you. The pilot chute then drags the main chute out from the container. The lines are rubber-banded in alternating courses and they deploy evenly as each loop slips out of the rubber bands. Clearly, a lot of though goes into the design and into the packing process. The repacking process consists mostly of a close inspection of the lines, the canopy, the container, and the other elements of the chute. 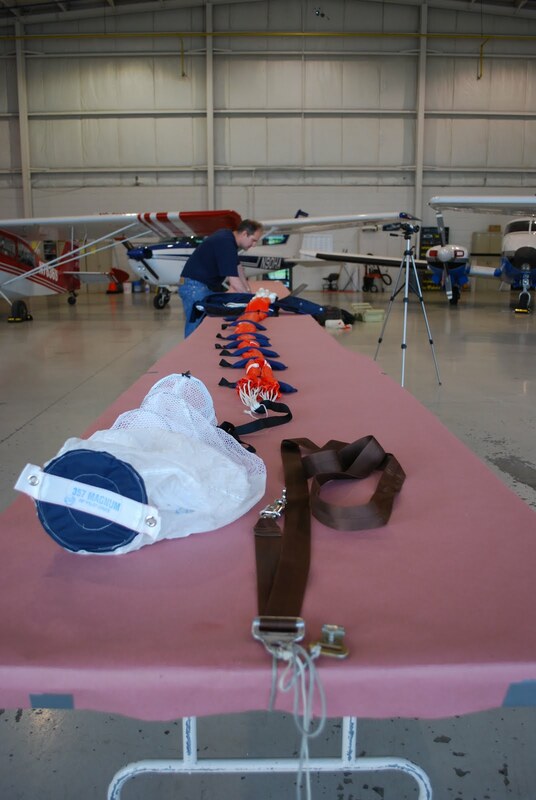 Some items are inspected initially when the chute is laid out on the table and other inspection elements occur as you’re re-packing. It’s fairly regimented, just like a preflight check or some cockpit procedures – a flow that most pilots would recognize and appreciate. And Todd pulled the manuals from the Internet to make sure that the pack sequence was according to the manufacturer’s spec. And here’s the particularly interesting part. Obviously, most chute aren’t deployed between re-packs. That means that, as a rigger, your pack job is going to be seen in close detail by the next rigger. If you thought that pilots were critical of each other, you ought to hear the stories about riggers. Some riggers can identify a previous rigger’s pack job just by looking at it. And, if you screw something up and someone else repacks that chute after you, you’ll likely hear about it from the subsequent rigger. I like that sense of professionalism and the willingness within the rigger community to self-police. I hope I never have the need to deploy an emergency parachute. But, if I do, the experience last night gave me a lot of confidence in these vital safety systems.